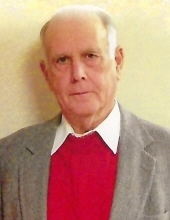 Mr. James Junior Harmon of Greensburg, Kentucky, son of the late Willie Harmon and Gladys Corbin Harmon, was born on June 1, 1940 and departed this life on Wednesday, November 14, 2018 in Dayton, Ohio. He was 78 years, 5 months, and 13 days of age. He had made a profession of faith in Christ, was a member of the Mt. Gilead Baptist Church, and was a farmer. Survived by his wife of 59 years, Margie Ellen Vaughn Harmon, having united in marriage on October 7, 1959. Other survivors include a son: J. Dale Harmon of Hendersonville, Tennessee; two daughters and a son-in-law: Karen and Chad Breashears of Arkadelphia, Arkansas, and Melissa Martin of Old Hickory, Tennessee; six grandchildren: Mallory and Adam Hyman, Cody Harmon all of Bowling Green, Jacelyn and Bryan Bates of Virginia, Cameron Breashears, Maddox Breashears both of Arkansas, Jordan and Alisa Montgomery of Frankfort; three great-grandchildren: Brylee Bates, Griffin Bates both of Virginia, and Marlee Montgomery of Frankfort; sisters: Mary Moss of Greensburg, Lizzie Mae Veach of Columbia, and Rosella Bennett of Russell Springs; and a host of other relatives and friends. Mr. Harmon was also preceded in death by three sisters: Ana Lou Shirley, Marie Loy, and Betty Shirley. The funeral services for Mr. James Junior Harmon will be conducted at 2:00 P.M., Central Time, Saturday, November 17, 2018 at the Mt. Gilead Baptist Church with burial to follow in the Mt. Gilead Church Cemetery. Bro. Steve James and Bro. Jason Shirrell officiating. Visitation is requested after 10 A.M., Central Time Saturday at the Mt. Gilead Baptist Church until time of the funeral service. Cowherd and Parrott Funeral Home in charge of the funeral arrangements. The family has asked that expressions of sympathy take the form of donations to the James Harmon Memorial Fund for Mt. Gilead Baptist Church, which can be made at the funeral home. To plant a tree in memory of James Junior Harmon, please visit our Tribute Store. "Email Address" would like to share the life celebration of James Junior Harmon. Click on the "link" to go to share a favorite memory or leave a condolence message for the family.